Compatibility: fit for most standard water bottle (for big ones, the top part may not be covered). Durable top drawstring, mil-spec construction, correct spacing and attached well. It can also hold a foldable umbrella, hanging some pens or other EDC tools. MACHINE WASHABLE: Mesh fabric, durable nylon and mesh fabric with high resilience combined, permeability stronger, more suitable for outdoor use.Constructed of Waterproof High Density Nylon Material;For Molle System Design, Easily connect to Molle Vest,Belt and Bag. SPECIFICATION: 7.5-inch height, 3.5-inch diameter, 3.6-oz weight. Wider and lighter than other pouch. 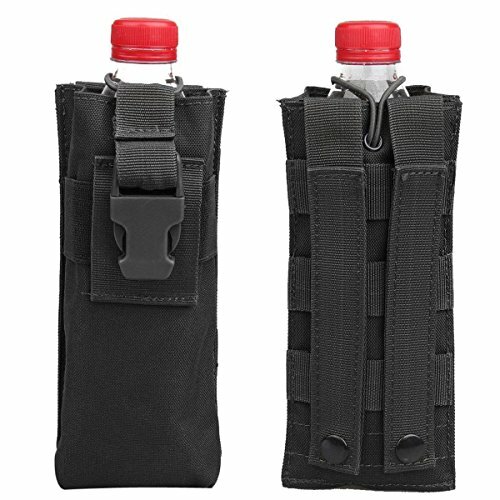 Fit for most standard water bottle. Even can hold some a foldable umbrella or some small EDC tools for hands-free. MULTI-FUNCTIONAL USE:Perfect for outdoor activities like traveling hiking hunting boating jogging climbing or war games and etc. Providing you with quick and easy access to water at a moment's notice.